Inspired by a lithograph called “Belvedere” by M.C. 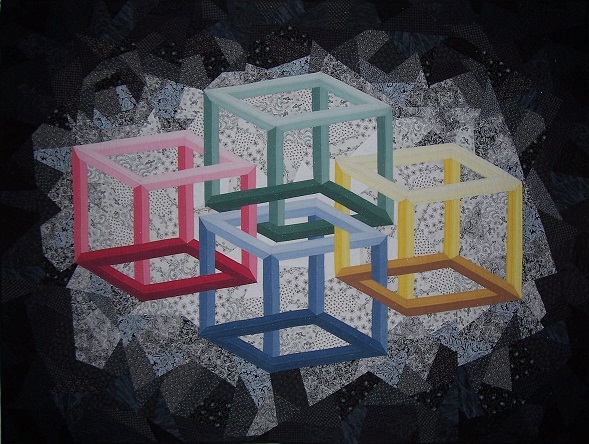 Escher which has a small image of a person playing with an “impossible” cube in the lower left corner, I played with the shape, intertwining three cubes and then four to come up with this design. After choosing colours for the cubes, I experimented with several backgrounds, trying a variety of colours until settling on a black to white gradation in a shattered glass pattern. The quilt was constructed using templates, machine-quilted with a double-threaded needle, and then embellished with small glass beads.